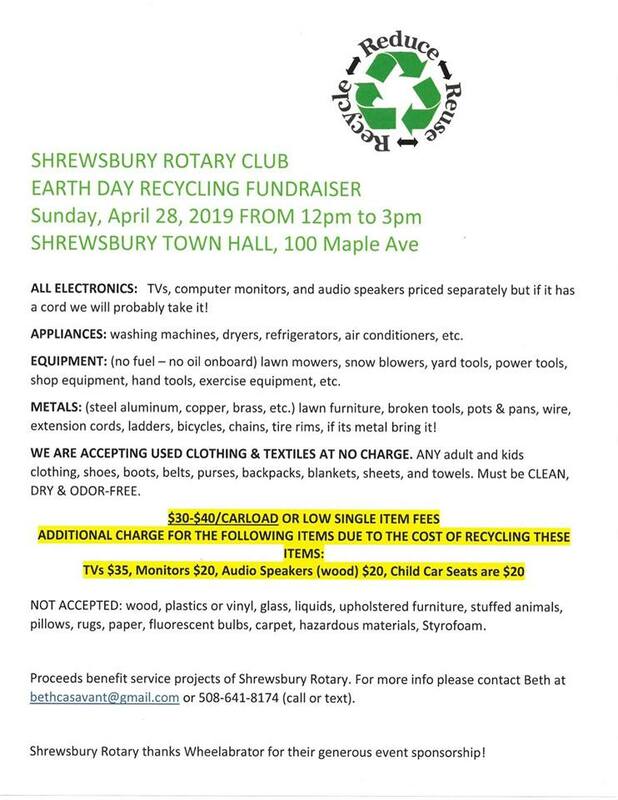 Our Earth Day Recycle Fundraiser will be held on Sunday, April 29th, 12pm - 3 pm at the Shrewsbury Town Hall, 100 Maple Avenue. Proceeds benefit service projects of the Rotary Club of Shrewsbury. Thank You to Wheelabrator for their generous sponsorship of this annual event. The club welcomed Dr. Brian Maher and Dr. Lauren Hamm from Shrewsbury Family Chiropractic as guest speakers on April 8th. 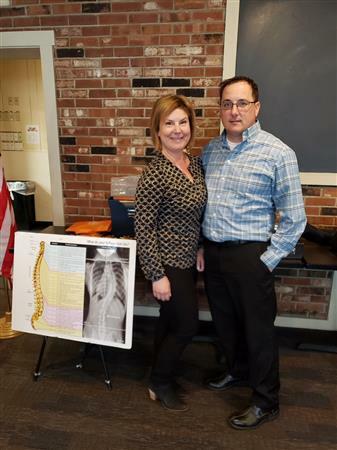 Dr. Brian and Dr. Lauren spoke about the benefits of chiropractic and how a chiropractic lifestyle can contribute to improved quality of life and well being. 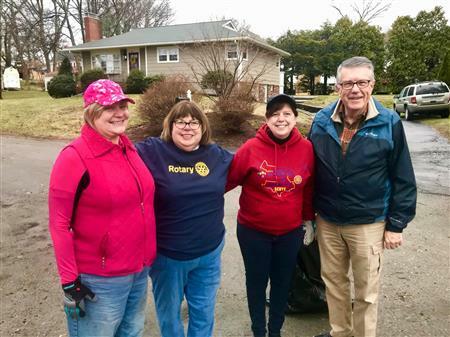 Shrewsbury Rotarians participated in the annual Shrewsbury Town Clean Up Day on April 6th. Great job cleaning Rotary Park of winter debris and litter so that residents can enjoy peaceful location on Mill Pond. Shrewsbury Rotarians had a fun morning volunteering at Binkeez for Comfort. 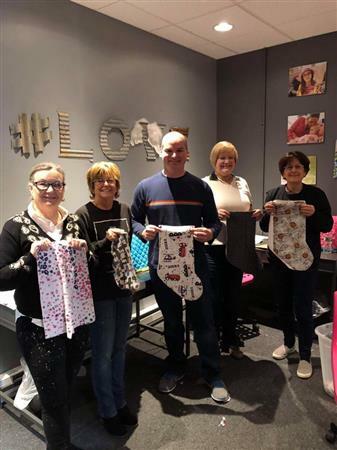 Thankful for the opportunity to “share the love” cutting material to be made into holiday stockings for children struggling to survive life-threatening illnesses, acute developmental and mental disorders and severe burns. Director of Public Facilities for the Town of Shrewsbury, Angela Snell, was our speaker on March 12th. With the recent re-organization at Town Hall, Angela has expanded her role from Parks and Recreation/Cemetery to also oversee Public Buildings. Angela and her staff are responsible for maintaining all 19 town buildings, 19 public parks, the Donahue Rowing Center, 6 athletic fields and the Mountain View Cemetery. Angela spoke about the work she and her staff conduct to maintain public buildings and recreation space as well as planning for the Memorial Day Parade and working with the Girl Scouts to place flags on veteran graves at Mt. View Cemetery. Angela also does commendable work with Special Olympics and the programs that are offered throughout the year. The men's basketball team successfully represented the USA in Abu Dhabi earning a silver medal! Members of the Shrewsbury and Worcester Rotary Clubs recently visited Abby’s House. Abby’s House provides homeless, battered, and low-income women and their children with shelter, housing, and support services to help them get back on their feet. The Two clubs jointly donated 20 dressers to Abby’s House. Angela Tivan led the Shrewsbury project to obtain a District Grant. Barbara Guthrie led the Worcester club effort. Planning has begun for the 4th Annual Food & Brew Fest. Mark your calendars for Sunday, June 23th 2019 from 12:00 PM to 3:00 PM at Avidia Bank, 23 Maple Ave, Shrewsbury. Information for vendor participation, sponsorships, and tickets will be available soon! 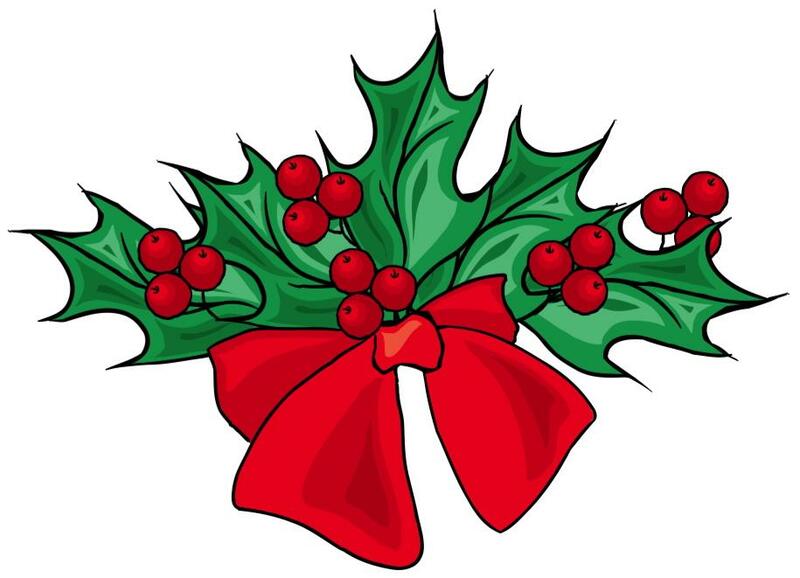 On Monday, December 10th our meeting will be spent celebrating the holiday season with a buffet lunch and Yankee Swap. Swap gifts should not exceed $20 in value. There will not be a regular lunch meeting on Monday, December 17th as many members are volunteering to set up the annual SYFS Toy Drive as part of the Rotary Freshman Service Project. UPDATE!!! The new hours for set up are 8am-11am to accommodate the increased number of families signed up for the toy drive. Many thanks to Lori Jones for going shopping to purchase the gift wrap, tape and bows for each family. If you have signed up to do some shopping, please drop off your items by Friday, December 14th at SYFS so that we have them in time for the shopping day set up. The Freshman members of the Rotary Club are partnering with Shrewsbury Youth and Family Services (SYFS) to manage the annual holiday toy drive that provides holiday toys for children and teens served by SYFS and the Department of Children and Families. The drive kicked off in early November and culminates with a shopping day for families in December. 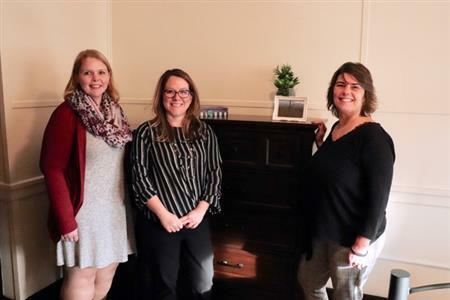 Freshman Rotarian and Executive Director of SYFS, Christine Mowry, along with SYFS Business Manager and Freshman Rotarian Lynn Lynch, brought the idea to the group in September. 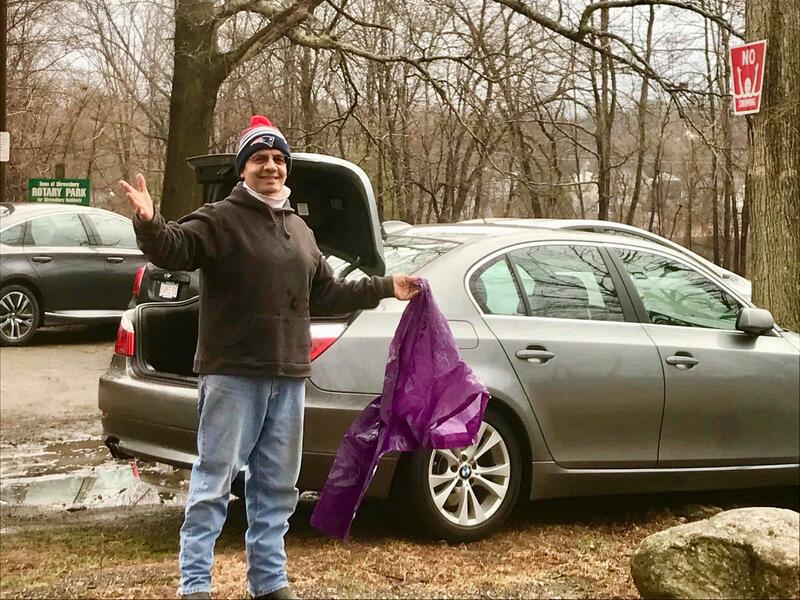 Enthusiasm for the project was immediately evident, with members pitching in to wrap giant collection boxes and pick up donated items on a weekly basis throughout the drive. A goal of the project is to encourage all Rotarians to get involved. A Sign Up Genius was created to organize the volunteer needs and can be viewed through this link: https://www.signupgenius.com/go/30e0a4aa4a928a46-syfs. On December 17th from 8am until 11am Rotary members will gather at Trinty Church to set up the shopping experience for the families served by the toy drive. Parents and caregivers will then be able to "shop" for just the perfect gifts right down to stocking stuffers, gift wrap, tape, bows and gift tags. Any left over gifts and supplies will be picked up by the Department of Children and Families and distributed to other needy families. There will be no regular Rotary meeting on December 17th. Jan Mark shared information about the Rotary Friendship Exchange, a Rotary activity launched by Rotary International in 1984. Rotary Friendship Exchange (RFE) offers Rotarians and their spouses or partners to experience other cultures by visiting each other's countries and homes. the program is reciprocal and lasts for a maximum of 12 days. The purpose of the exchange is to stimulate international understanding, create goodwill and peace, as well as link international contacts through person to person contacts across international borders. Jan's Rotary Club in District 2390 in Helsingborg, Sweden participated in this program with a club in Chinese District 3461 in Taiwan. Jan is anxious to establish and exchange with our District and will be speaking to the Worcester Rotary Club as well. 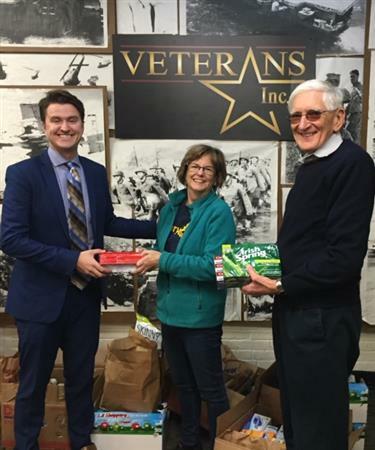 For the fourth year, the Rotary Club joined forces with the Lion's Club of Shrewsbury to collect needed personal care items for clients at Veterans, Inc. Shoppers at Price Chopper in Shrewsbury were given lists of needed items as they entered the store. Members of both clubs collected the items as shoppers left the store. A great community effort to remember and thank our veterans for their service around the time of Veteran's Day! At the October 1st meeting, President-Elect Stephanie Luz installed Betsy Hudson as the newest member of the Shrewsbury Club. Welcome Betsy! 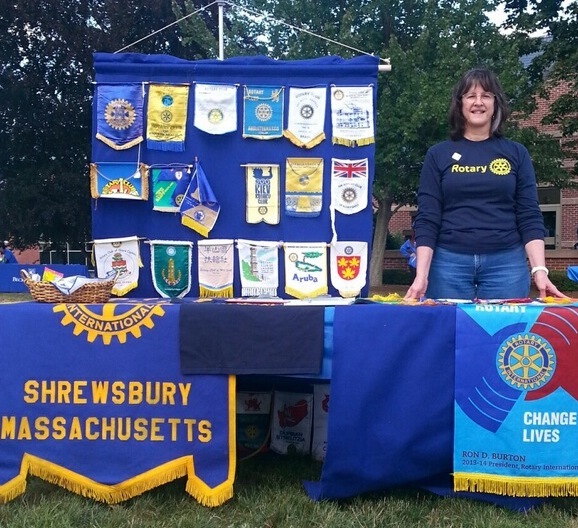 The Rotary Club of Shrewsbury participated at the 22nd Annual Spirit of Shrewsbury Fall Festival on September 29th. 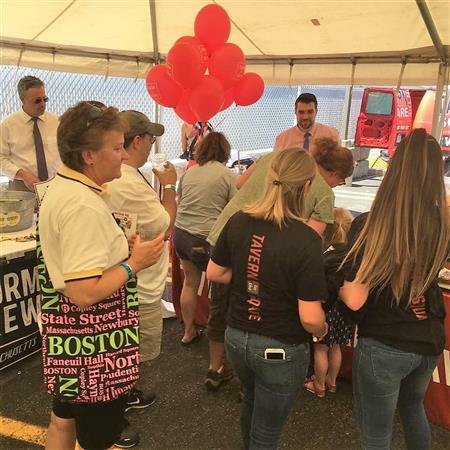 The Town Expo on Saturday is a popular event celebrating business, town, civic, educational, and religious organizations. It's always a pleasure to welcome Don Musial, General Manager of Wheelabrator Shrewsbury, to our meetings. On August 13th, Don spoke about environmental performance and efficiencies at the town landfill. And did you know they have bee hives and make their own honey? Welcome to our newest member, Rob Guinard, Director of Community Relations for Benchmark Senior Living at Shrewsbury Crossings! Rob was inducted by Shrewsbury Club President, Kathy McSweeney at the May 7th meeting. Congratulations to Rob for joining Rotary to get involved and make a difference. 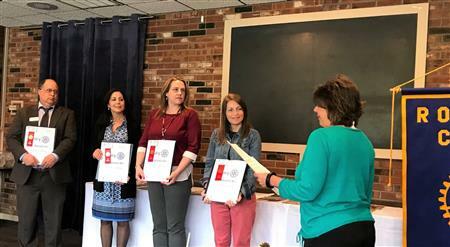 Four new members were installed at the club meeting on April 30, 2018. Welcome to Emily Chiarelli of Benchmark Senior Living, Michael Richard of United Bank, Amber Polisher and Colleen Lanza of Grafton Jobs Corps. 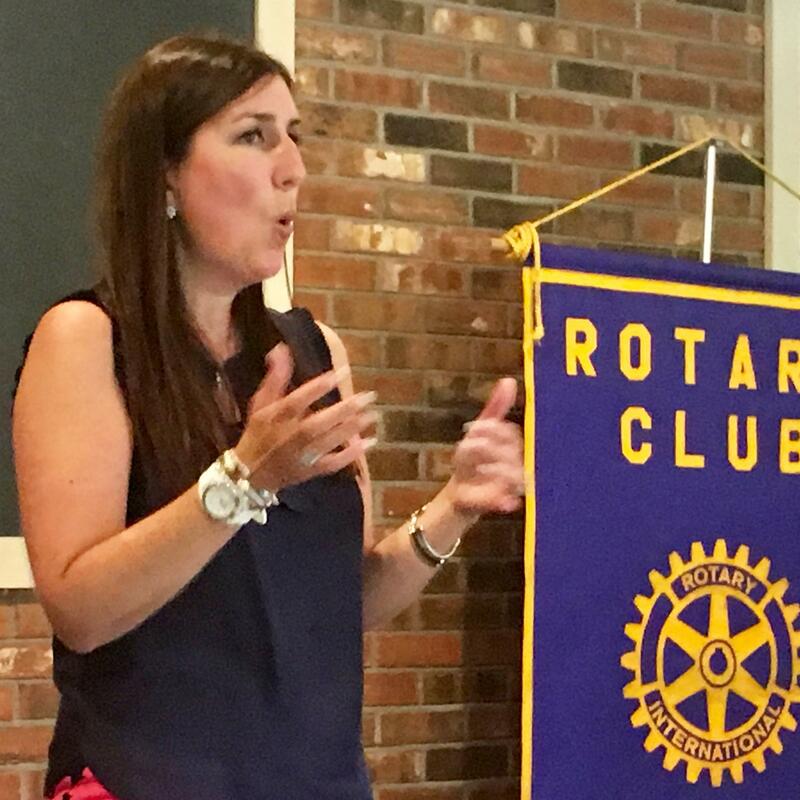 Darlene Trainor of the District 7910 Service Committee spoke to the club about planning hands-on service projects. The resultant discussion produced a healthy list of potential new projects for the club, most of them of significant value to the community and yet easily accomplished. A Survey Monkey poll is being created in order to help the club sort through the list of potential projects and select the ones that will be pursued at this time. Members will receive the poll in 2 parts (the list of potentials is too long for a single Survey Monkey poll!). When you receive the invitations to take part in the poll, you are asked to respond to them as quickly as possible. 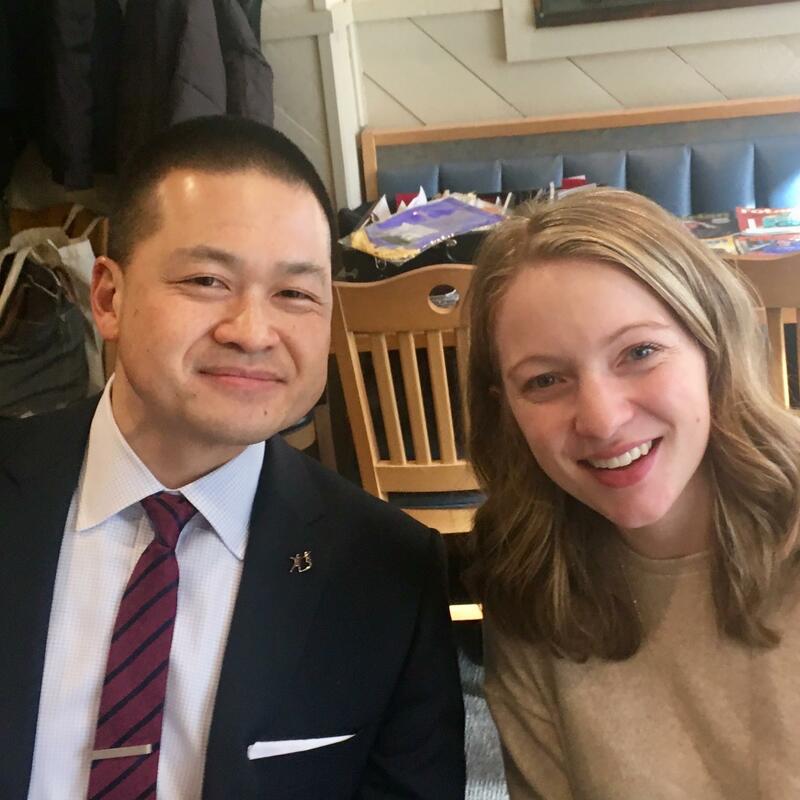 Big Brothers Big Sisters - Our former member and past president, Jeff Chin, now Executive Director of Big Brothers Big Sisters spoke to the club on February 5, along with his assistant, Colleen Shroth. He noted that many of the Littles come from single parent families, headed by a mother (52%) and 18% have incarcerated parents. Positive roll models are crucial. There is a crying need for Bigs with nearly 50 children presently on a waiting list. 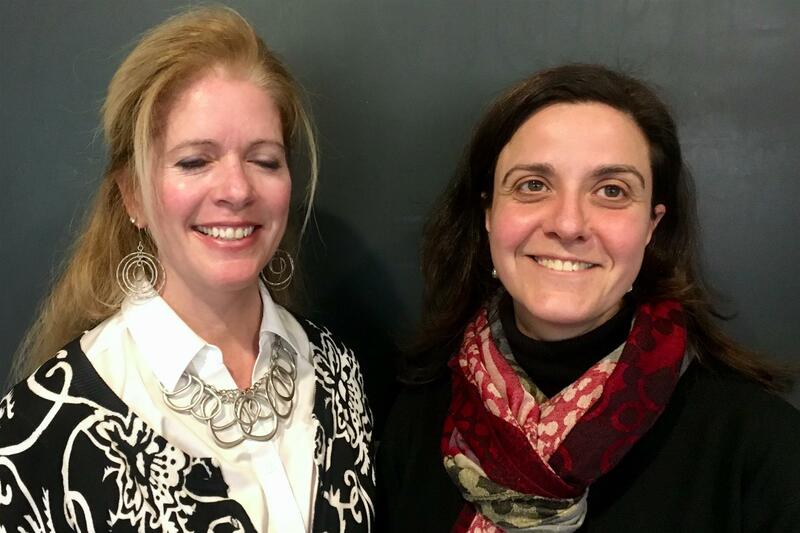 SHS Athletic Field Refurbishment - Michelle Biscotti and Kathleen Keohane addressed the club on February 12th to talk about the need for refurbishing the athletic field at Shrewsbury High School. The problem with the current field is that grass does not offer enough playing time in New England. In order for the field to be useable for full seasons, artificial turf is required. Additionally, artificial turn would extend the use of the field beyond football. It would also make it possible to play games in less than ideal weather conditions. The project to install and renovate the field is $2.1 million. Of that sum, $1.8 million needs to be raised. Currently fundraising is at $1.3 million. Rotary Leadership Institute - Owen Russell, club Vice-President, recently attended the Rotary Leadership Institute. Like all who have attended the institute before him, Owen gave a glowing report of this experience. He noted that RLI is not mandatory, as PETS is, but is recognized as valuable by Rotary International. Owen attended the first of the three part program. It began with breakfast on a Saturday and ran until 3:30 p.m. Subjects covered in part one include: insight into leadership qualities, how individual Rotarians fit into the “world of Rotary,” discussion of ethics of Rotary and vocational service, information on the structure of the Foundation, engaging and mentoring members, and creating service projects. From My Heart Book Launch - at Shrewsbury High School on March 28 - Members are needed to greet and serve dinner to this year’s authors and their guests. The event begins at 6:00 p.m. Rotarians assisting with the event are needed at 5:30 p.m.
District 7910 Assembly - on April 28th from 8:30 a.m. to Noon - All officers and committee chairs should plan to attend for training and all Rotarians are welcome for workshops. The event is at the Sheraton in Framingham. Register on rotary7910.org. Food & Brew Fest - on June 24th in the parking lot of Avidia Bank. This is another “all hands on deck” event and our major fundraiser. 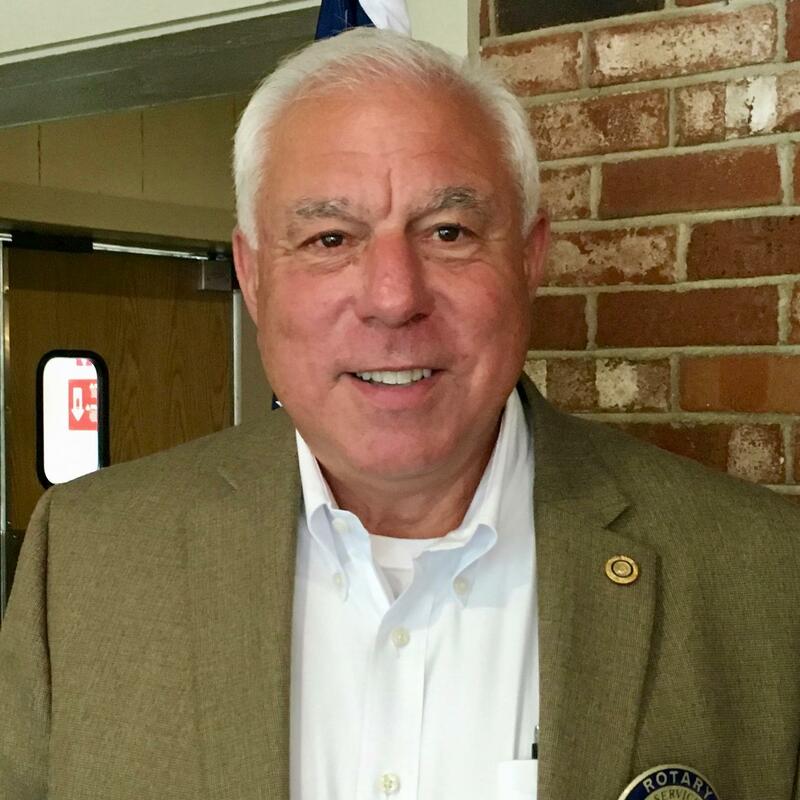 The Installation of Don Harbert as the club’s 2018-2019 president and the other officers of the club for the coming year is scheduled for June 18th. The installation will be held at the regular club meeting time of 12:15 p.m. and at our regular venue, The Post Office Pub. The Guest Speaker will be Shrewsbury Town Manager, Kevin Mizikar. Kevin will offer his reflections on his first year as Town Manager and where he sees the club going in the next few years. No Meeting Monday, March 26th. There will be no Lunch Meeting on Monday, March 26, 2018 as many of our members will be attending the District 7920 "Service Hero" dinner on Monday Evening. Congratulations to long time Shrewsbury Rotarian Art Dobson who will be honored as a Rotary Service Hero at this District Event! Now that all of our club’s doings run through ClubRunner, it’s more important than ever to keep our club calendar up-to-date. Our club secretary, Cliff Gerber, tends the calendar, but can’t be responsible for all dates. If you are responsible for a club event, it is mandatory that you drop Cliff an email asking to have any and all relevant dates put up on the calendar. By doing that, you will ensure that they appear on our website, in our bulletin and in the ClubRunner app. The Shrewsbury club’s goal for this year is to average a $125 gift per member. We regularly exceed our goal and we are counting on all of our members to help us maintain our excellent record. Donations to the Foundation support projects at home through District Grants and Global Grants, fight cancer, provide healthcare in places of need, provide clean water among a variety of other charitable causes. Most prominent of all is Rotary’s effective crusade to eradicate polio. The Rotary Foundation is highly rated by Charity Watch and was cited by CNN as the most effective global charity. The 2018 Rotary International Convention will be held from June 23rd to 27th in Toronto, Canada. This will be the closest convention geographically to our club and district in a number of years. Thus, this is a very accessible convention for members of the Shrewsbury club. If there is any club member who might be moved to consider attending the convention, they should speak with Club Secretary, Cliff Gerber. He can provide you with registration materials. In addition to registration materials, each member club of Rotary International is entitled to a voting delegate. Cliff also has credentials that can be provided to a club member who decides to attend and is approved by the club to represent it. Congratulations to Derek Grillo’s mother, Barbara Cotter. Barbara was named a “Hall of Farmer” by The Worcester Business Journal. Barbara owned and operated the Struck Cafe in Worcester. The cafe spawned Derek’s catering business, Struck Catering. We all know of the great food produced by Struck and congratuate Barbara on this significant recognition. The speaker at the December 4th club meeting was Marilyn Taylor, Life and Wellness Coach. Marilyn became involved in life and wellness coaching through her other profession, that of massage therapist. Marilyn became involved in deep conversations with her clients that led her in a new direction. Marilyn asked the club members how they measure success, careers, wealth...? "What if we measured success by what makes us happy? she asked. She noted that a 2009 study on income and satisfaction shows that an income of $75,000 was a plateau beyond which there is no change in the perception of happiness. Today, she believes that might equate with about a $90,000 income. "What you fell is your messenger of where you are in life—what your level of satisfaction is. In terms of reported happiness, about 50% is from genetic makeup, 10% is from financial well-being and 40% is derived from intentional activity on a person's part. Areas of that intentional activity have to do with: 1) having and nurturing 1 or 2 positive relationship, 2) acts of kindness and compassion, 3) exercise, 4) being in the flow of life [examples - golf, music), 5) spiritual engagement and meaning, 6) using your strengths, and 7) having a positive mindset. On January 8th, the club was please to welcome new members. Pictured here from left to right are Lynn Lynch, Christine Mowry, Missy Hollenback and Club President, Kathy McSweeney. Christine is the new Executive Director of Shrewsbury Youth and Family Services, and Lyn is the Business Manager of SYFS. Together, they replace the memberships vacated in the Corporate Membership of SYFS. 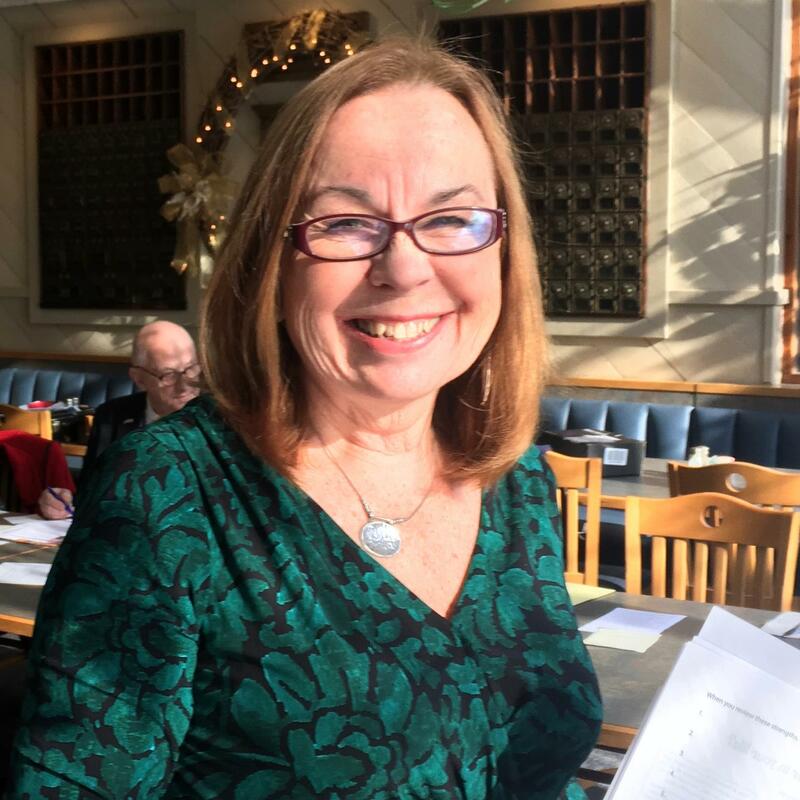 Missy is a well-known community activist and has been the guiding light behind the successful Shrewsbury Farmer's Market, along with a variety of other community projects. We are excited to have Lynn, Christine and Missy among our members! Dates have been set for two crucial club fundraisers: EARTH DAY RECYCLING EVENT is scheduled for April 22; THE FOOD AND BREW FEST will take place on June 24th. Club members should put those dates on their personal calendars and save them. Many hands make light the work. Not only that, but it's fun to get together to work on these events. 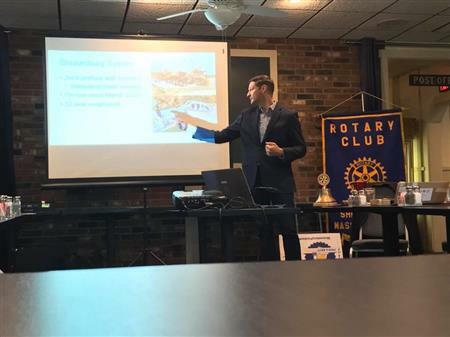 On November 27, Stephen Sykes spoke to the Shrewsbury Rotary about the March of Dimes. Stephen's background had been in banking, but he didn't feel that was a good fit for him and so—when he was laid off—his wife advised him to follow his passion. He began working for the March of Dimes writing letters of thanks to donors. The March of Dimes, originally chartered by FDR to raise money to fight Polio in the U.S., now works in all areas of infant mortality, pre-term births and birth defects. Today, the organization works to ensure that mothers have access to good care and are not forced out of the hospital too soon after the birth of their child. Other areas in which the March is active is in direct care to infants at the UMass Memorial NICU, male fertility issues and the promotion of breast feeding. Emileigh Tivnan was the most charming and aggressive solicitor of toiletries when the Shrewsbury Rotary and Lions joined forces to collect them for clients of Veterans Inc. While people walked past adult Rotarians and Lions without giving an opportunity to explain what we were collecting and for whom, as we stood in the entry way of Price Chopper supermarket, no one could resist Emileigh. She would simply approach shoppers with a list of suggested items, a smile and an invitation: "Will you make a donation?" 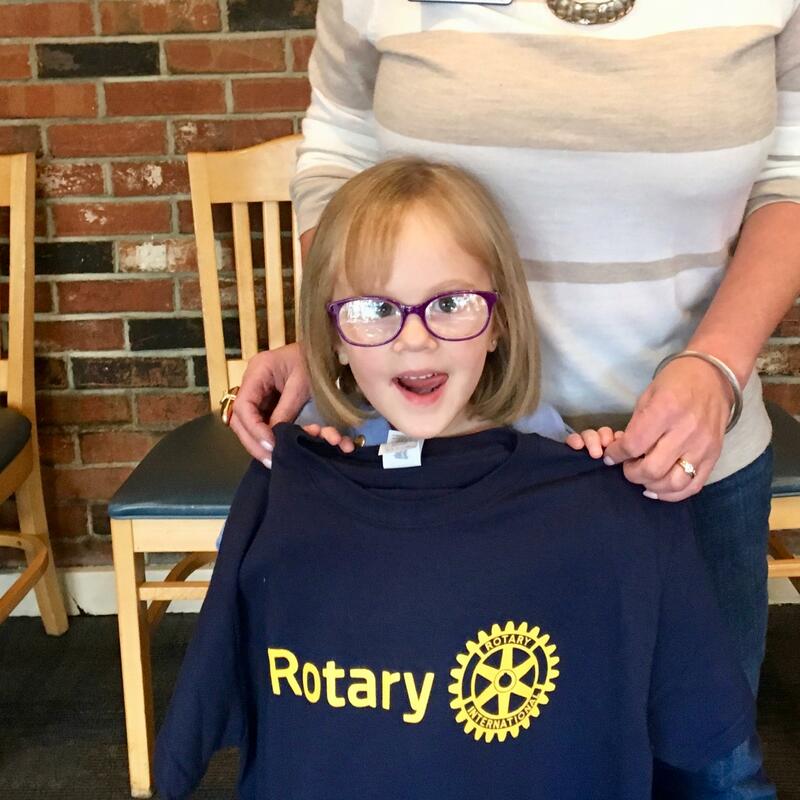 With thanks for her invaluable assistance in the collection, the club awarded Emileigh her very own " Rotarian at Work" T-shirt. Of course it will be a couple of years before the shirt will fit her properly, but—in the meantime—she can wear it as a dress. The Rotary Club of Shrewsbury will be awarding two or more $2,000 scholarships to high school seniors who are planning to attend college in the fall of 2018. These scholarships are paid directly to the student recipient upon their successful matriculation to college and may be used for any educational expense that the recipient chooses (examples: tuition, room and board, books, travel to and from school). The Rotary Club of Shrewsbury will also be awarding two or more $500 to $1000 scholarships to high school seniors who will be pursuing a certificate program in their career or trade or immediately entering their career or trade following high school graduation. Awards can be used toward a certificate program or to purchase tools for one’s chosen trade and are paid directly to the recipient to reimburse the purchase of tools or cost of certificate program. Any high school senior who lives in Shrewsbury or attends high school in Shrewsbury is eligible to receive a Rotary Club of Shrewsbury scholarship. Applicants should be aware that the Rotary Club of Shrewsbury is an affiliated club of Rotary International, a world-wide service organization. In keeping with Rotary’s motto of “Service Above Self,” an applicant’s record of involvement in service organizations and projects is given very high consideration in the awarding of the scholarships. Academic achievement and need are also considered. Applicants will be expected to complete an application, provide one letter of recommendation, provide a transcript from your school’s guidance office as well as provide personal contact information. All applications must be received by March 23, 2018. To obtain a scholarship application, please contact Donald Harbert by emailing don.harbert@gmail.com. Applications are also available from the guidance offices at Shrewsbury High School and at Assabet Valley Regional Technical High School. Mike Collins, son of Shrewsbury Rotarian, Jack Collins, recently had his latest documentary film, Almost Sunrise, shown nationally on PBS in conjunction with their Veterans’ Day series. Mike got his start as a film maker when a group of Shrewsbury Rotarians went on an exchange program to the Soviet Union. Mike's last film was nominated for an Emmy and this one on helping returning vets heal from the moral injury that so many of them face is winning acclaim across the entire country. It has been embraced by the VA social workers as well as national veterans organizations and military leaders. The documentary has played all across the country and has been shown at the Lincoln Center in NYC to full houses. 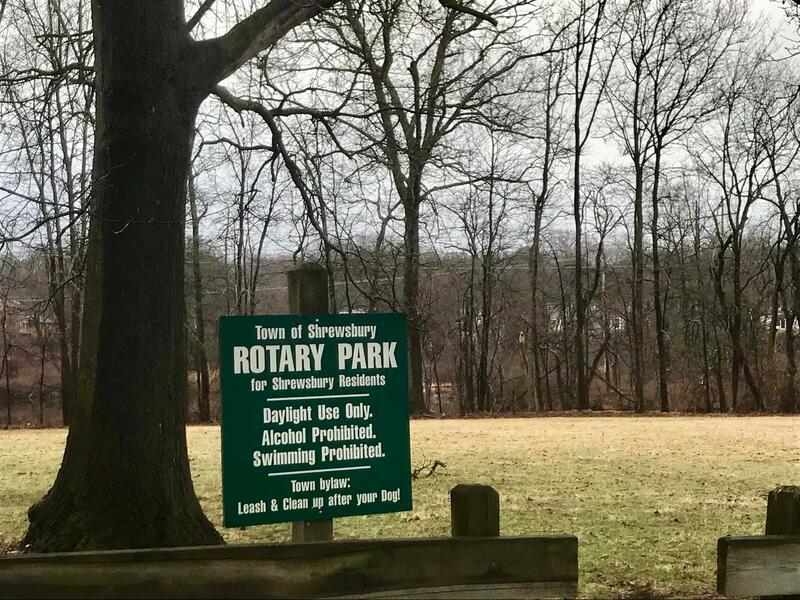 Thanks to Rotary husbands, Josh Merriman and Roger Parent, for installing the new Rotary sign and club information sign on Route 9. 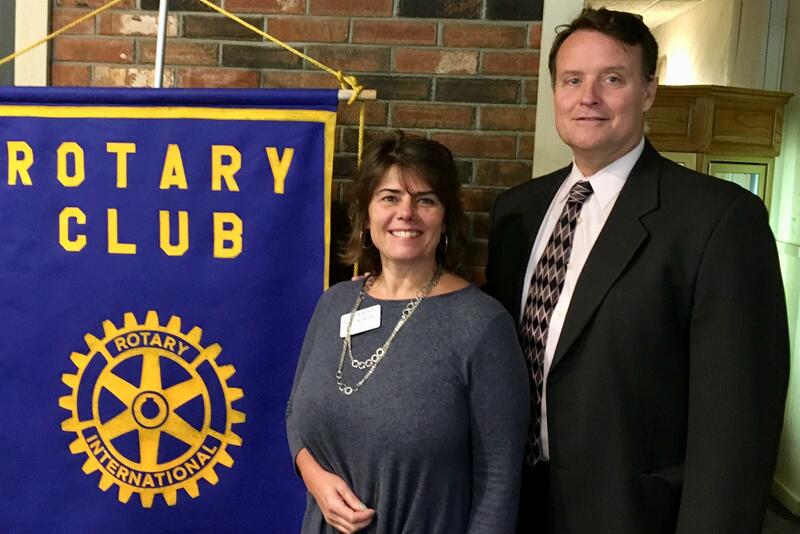 John and Beth McHoul of Heartline Ministries in Haiti spoke to the club on November 13. 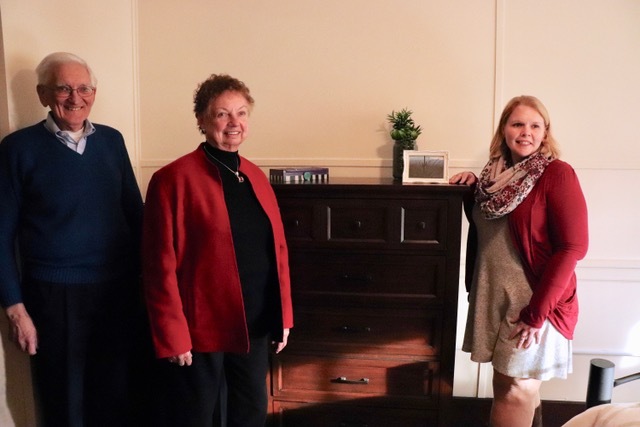 Heartline was a recipient of a donation from the Shrewsbury club in 2016, which was used to update the electrical supply of a kitchen at Hearline's maternity center. John and Beth, originally from Quincy and Weymouth went to Haiti in 1989. They were impressed by the level of poverty there wound up staying in Haiti where they have continued to work to alleviate both causes and effects of poverty in that island nation. Noting that babies die in Haiti by the thousands because mothers don't know how to care for or feed them, the McHouls made it their mission to educate mothers in child care. That mission branced out into giving mothers job skills. Beth, who is a midwife, assists in giving care to mothers and children for the first year of life; she notes that they have not lost a mother in their years of working in Haiti. In addition to the maternity center, job skill are offered for both men and women. They teach sewing and cooking, teach reading and operating a bakery that trains and employs 50 men. The bakery uses 1,000 pounds of flour each day. In addition to selling baked goods, the supply bread and pizza for the center and local prison. Their next project will be a reverse osmosis water treatment system to make clean, cheap water available. They also provide schooling for children. 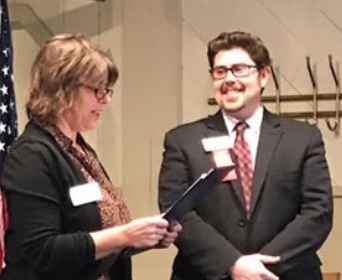 Matt Armenti was welcomed into membership in the Shrewsbury club on November 20, 2017. Matt is the branch manager of the new UniBank office at Lakeway Common. Lakeway Common is the development on the former Spag's location. 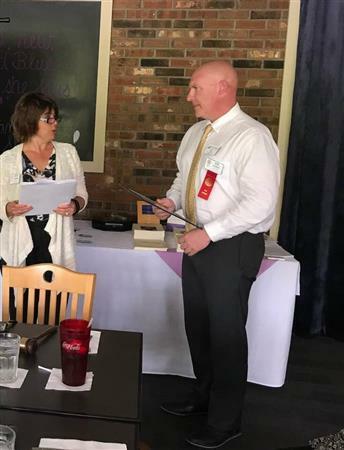 Welcome to Rotary and to the Shrewsbury club, Matt! 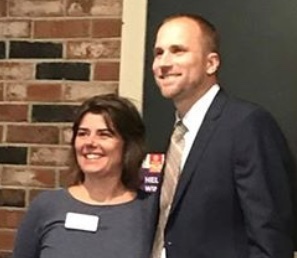 Pictured here with President Kathy McSweeney is the new Shrewsbury Town Manager, Kevin Mizikar. Kevin was the guest speaker at Shrewsbury Rotary Club's weekly meeting on November 6. Kevin spoke about his family and growing up in a rural area outside of Pittsburgh and about his impressive professional career. Kevin shared his vision and goals as Town Manager. Mark your calendars now for upcoming Holiday celebrations of the Shrewsbury Club. December 7, 2017, Holiday Party to be held at the home of Club President, Kathy McSweeney. This will be a "bring an hors d'oeuvre and bottle of wine" event. Significant others are especially invited to this event. Tentative start time is 6:00 p.m. Watch for further details. December 18, 2017, Holiday Luncheon will be the meeting for that date. The luncheon will be at the usual time and in the Post Office Pub. A luncheon will be planned. A busy week in the life of the Rotary Club of Shrewsbury continues into the coming week. So far, during the past week, club members have: 1) served dinner to more than 140 of Shrewsbury's Senior Citizens, 2) Joined with Shrewsbury Lions to collect toiletries for the residents of the Veteran's Inc. shelter for homeless veterans, and 3) participated in a Trivia Night to benefit the Shrewsbury Education Foundation. Coming up in the next couple of days will be: 1) Reading Day when Rotarians will read to children in each of Shrewsbury's 2nd grade classes and present the libraries of those classes with award winning examples of children's literature, and 3) meet Shrewsbury's new Town Manager, Kevin Mizikar at its regular club meeting and hear his reflections on his first five months on the job. Steve Levitsky visited the Shrewsbury club on October 30, to talk about the Rotary Foundation. He pointed to the NIC View project--in which our club was involved with other Central Massachusetts clubs to provide monitoring of babies in the NICU at UMass Memorial. Parents from around the world are able to log on and view their children 24/7 while they are in Neonatal Intensive Care. For his part, Steve has a daughter who was in the NICU in Philadelphia. Her weight had dropped precipitously after birth and was placed in the unit. The on way that his family could check on her was to go to the hospital. The service to families in similar circumstances in our area, that clubs were able to provide through District Grants from the Foundation, is what the Rotary Foundation is all about. Steve emphasized that the Foundation, begun 100 years ago this year with an initial donation of $26.50 exists to help clubs do good things. 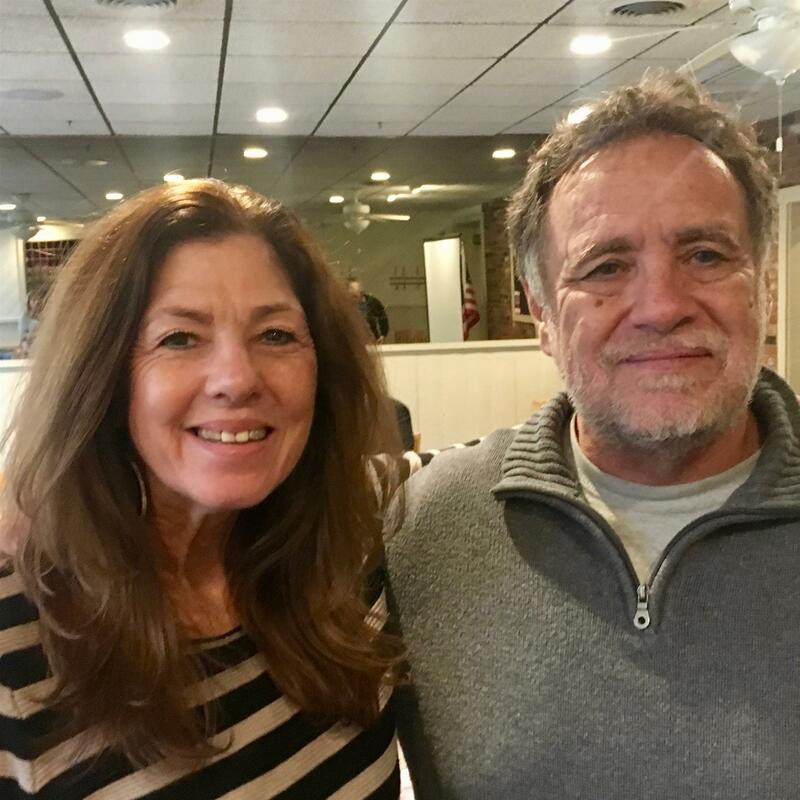 He noted a project that his club in Concord headed up that raised $61,00 for the transportation needs of an orphanage in Haiti as another example. He said that the Foundation takes the gifts of Rotarians, grows them and then turns them back to worthy projects of clubs around the world. Those donations from Rotarians have brown to over $3 billion over the past 100 years. Last year District 7910 raised $205,00 in giving to the Annual Fund and $1.3 million was pledged in major gifts, most of those pledged from the wills of donors. This year's goal is to reach $2 million in major gifts. The highly rated Foundation spends 91% of its funds directly on projects. Massachusetts Senator, Mike Moore, was the speaker at the October 16th club meeting. As did Rep. Hannah Kane several weeks ago, Sen. Moore noted that the Massachusetts legislature is made up of 160 Representatives and 40 Senators. The legislative session is a 2-year cycle. Sen. Moore noted that from 5-6,000 bills are filed each year and, ultimately, 3-400 are passed in a 2 year cycle. It is when bills get to a committee that issues arise. One example that he noted is legislation that reacts to the fact that Massachusetts lags in offering college credit for high school students taking college level courses. Not all state institutions accept credits from high school study, and the bill would force them to accept it. This issue bogs down in discussion of issues of reciprocity with other states and questions of whether one college/university's credit is equal to all others. An issue that the senator discussed was a "Safe Community Act" which essentially proposes that Massachusetts be a "sanctuary state." There are questions of whether state law enforcement has authority to detain persons based on INS detainer requests. 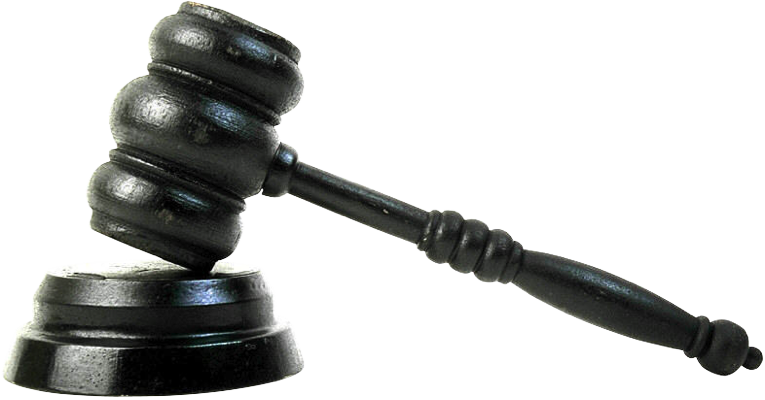 Courts have said that they do not, unless the person has violated certain specific acts. The Baker Administration has offered a bill to authorize detaining; the legal community says that that bill will not work. Sen. Moore discussed a land zoning bill introduced in the last session and passed by the senate. The bill is intended to address overdevelopment and access to affordable housing by standardizing land zoning across the state. Sen. Moore has voted against this bill. He noted, however, that there are both positives and negatives to the bill. One positive would be the simplifying of actions brought before local planning boards and would give property owners greater discretion over the use and/or sale of their land. Also discussed was the issue of sexual assault on college campuses. A pending bill would provide for representation for both victims and alleged perpetrators. Schools would also be required to file more data on allegations that take place on their campuses. Finally the senator noted that there is legislation pending to take action against bump stocks and other devices that effectively turn weapons into automatic weapons. Monday, November 6, is the Shrewsbury club's Literacy Reading Day. 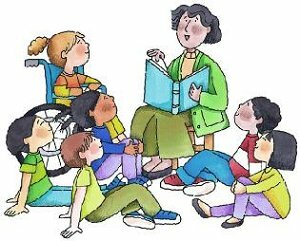 At the beginning of the school day, on that date, club members of the club go to each 2nd Grade classroom in the Shrewsbury Public School system and present the class with a selection of quality, Caldecott award books and read to the class. This is also an opportunity to tell the children a little about Rotary and what we do. This year, there will also be a Noon time meeting. 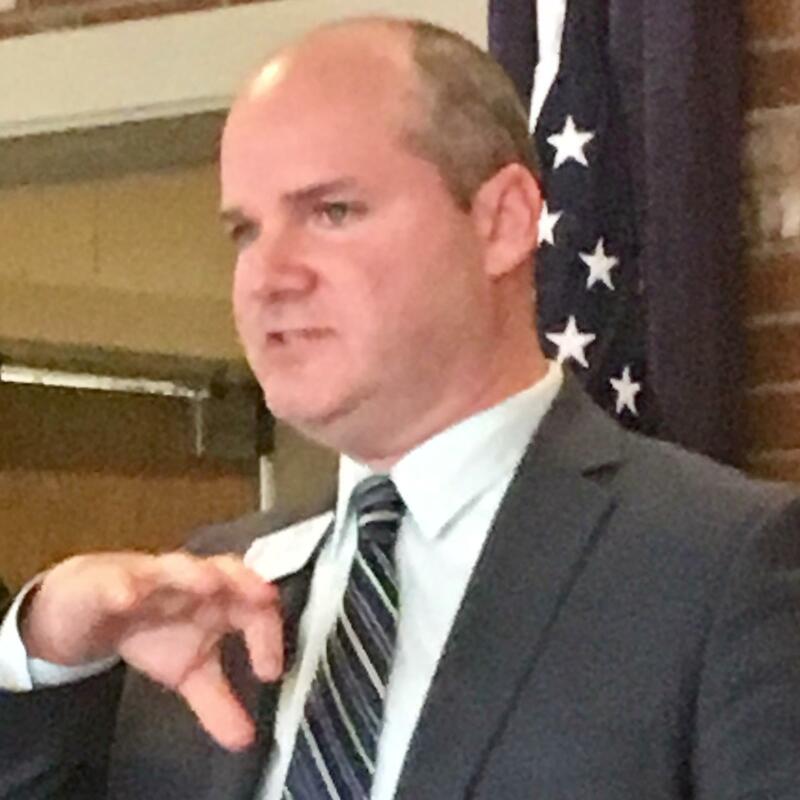 The speaker on that date will be Shrewsbury's new Town Manager, Kevin Misikar. Club members won't want to miss either the reading day--which is great fun--or the opportunity to meet and hear from our new Town Manager. All Rotarians who are able to participate in the Reading Day are asked to communicate with Owen Russell to ascertain the time and class in which they will read. Owen's email is <orussell@centralfcu.com>. What is the mission of the Rotary Foundation? Are donations to the Rotary Foundation tax deductible? YES. According to IRS Publication 526, Rotary International qualifies as a tax deductible charitable organization due to the humanitarian nature of its operations. Make your donation to the Foundation before December 31 2017 for a a tax deduction for 2017. * In 1947, the Rotary members contributed 1.3 million dollars in memory of Paul Harris. * In 1979, the Rotary Foundation began immunization of 6 million children in the Philipines against polio. * In 1980, Rotary committed to eliminating polio through immunization. * The Rotary Foundation has spent over $3 billion on programs and projects to support humanitarian efforts and scholarships through its 100 year history. The speaker at the October 2nd meeting of the club was Matt Ward, breakthrough champion. Matt spoke about overcoming an affliction that plagues most of us, procrastination. Matt described procrastination as that state when our passion and our focus are out of sync. Matt said that 90% of people allow their inaction to override their passion and so he listed five steps to overcoming that inaction. 1) Know why—Why do you want to take action? 2) Know the negative result of inaction. 3) Face your fears. We need to stare our fears down. 4) Be proactive. The quicker you take action, the more you accomplish. 5) Accept your failures. Failing doesn't make you a failure; not trying again does. Matt said that writing down what you want to accomplish makes it 42% more likely that you will succeed. In that spirit, he invited club members to write down one thing they want to accomplish by November 1 and add their telephone number and/or email address. He will contact each person on the first of next month to see if they have accomplished what they said they would. State Representative, Hannah Kane, was the speaker at the September 25th meeting of the Shrewsbury Rotary Club. Hannah is no stranger to our club and it was great to welcome her back to speak with us. Hannah gave a quick paced update on the 109th biennial session of the Massachusetts State legislature. Among the committees on which Hannah serves is Public Health and the Food Policy Council. She has also been giving substantial attention to mental health and substance abuse issues. She noted that Massachusets is a leader in combatting opioid abuse and noted that this is a major focus of District Attorney, Joe Early's committee on teens and tweens. Representative Kane has filed 24 bills. Twelve of those are related to the marijuana ballot issue that was promoted by the industry. She favors requiring the industry to answer to five--and not just one--commissioners. She is also concerned about limiting marketing access to youth and favors requiring the industry to illustrate that 85% of its ad audience are over the age of 21. Another of Hannah's bills has to do with good waste. She believes that we need to make it easier to donate food to programs to feed those who cannot afford food prices. She noted that we dispose of $700 worth of food per person per year which is both a disposal and an economic issue. She favors supervised medical parole for prisoners with terminal illnesses, which is both a humanitarian issue and a matter of the high cost of keeping these individuals incarcerated and cared for. Other bills she supports propose the requirement of a fiscal note to be attached to any bill affecting municipalities (which she says will not go anywhere), proposing regional school transportation for students from Shrewsbury to Assabet, supporting the Lake Quinsigamond Commission and another extending the definition of affordable housing to mobile homes. Among the accomplishments of the legislative year are a pregnancy fairness act, increased survivor benefits for public safety officials' families. For the third year running the Rotary Club will join forces with the Lion's Club in Shrewsbury to provide needed personal care items for clients at Veterans, Inc. Members of both clubs will supply shoppers with lists of needed items when they enter to shop at Price Chopper supermarket and collect the items that are purchased as shoppers leave the store. This is a great way to remember and thank our veterans for their service around the time of Veteran's Day. This year's collection is scheduled for November 4th from 11:00 a.m. until 3 p.m. in the lobby of Price Chopper. Club members will be needed in a minimum of two member for each of 2 two-hour shifts. Again this year, the Shrewsbury Rotary Club will be hosting a Senior Citizens' Dinner in conjunction with the Senior Citizens Preview of the Fall Play at Shrewsbury High School. Rotarians will be needed to host and serve our guests with food prepared by the great cafeteria staff of Shrewsbury High School. Rotarians should mark their calendars now and prepare to serve; it's a fun time for all. The date is November 2nd with the dinner preceding the 7:00 p.m. performance. Rotarians are asked to arrive at Shrewsbury High School at 5:00 p.m. The more hands serving, the better service we give to Shrewsbury senior citizens. Why was the Rotary Foundation established? 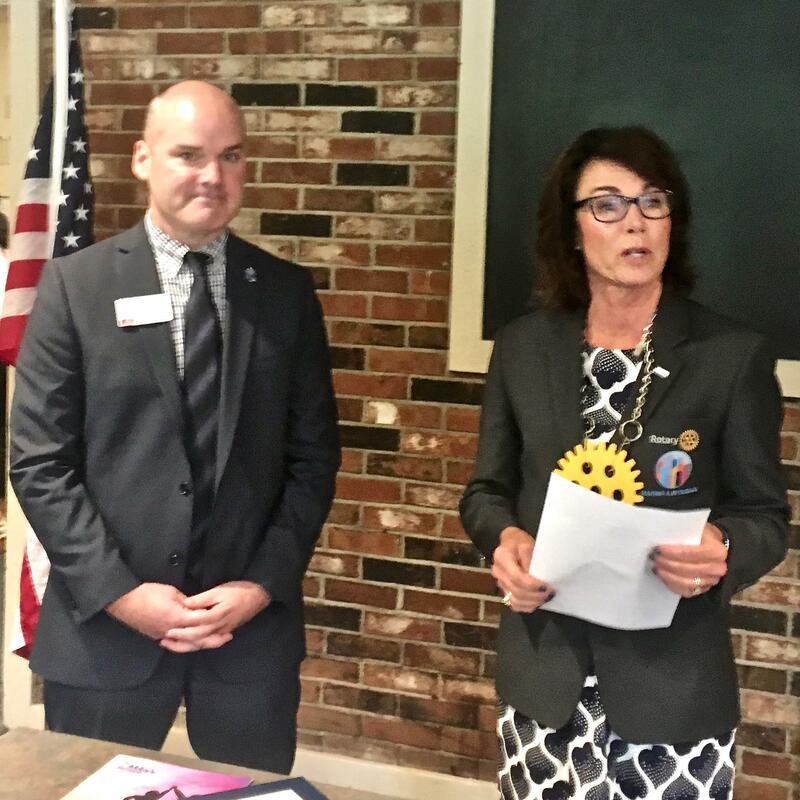 Owen Russell was received as the newest member of the Rotary Club of Shrewsbury at the club's meeting on September 18th. That being the date of the District Governor's visit, Owen had the honor of being inducted into the club by DG Karin Gaffney. Owen is the branch manager of the Shrewsbury Branch of Central One Federal Credit Union. In that position, Owen replaces our member, Joan Day who retired last spring. Owen has had a history of Rotary in his past. For several years, he was a member of the Rotary Club of Auburn. He has already been involved in several club projects and will be a valuable member of the club. We give a warm welcome to Owen as our newest club member. District Governor, Karin Gaffney made her "annual official visit" to the Shrewsbury club on September 18th. She was accompanied by our Assistant Governor, Elliott Rittenberg. DG Karin, who loves tasteful jewelry displayed the "tasteful" Rotary necklace that her husband gave her as a birthday gift (see photo!). Using the necklace as an illustration, she reminded club members that we are all gears on the wheel. When she took a leave from her job last March in order to assume the office of DG, her friends and relatives thought she had "gone over the cliff," but their remarks gave her opportunity to explain what Rotary does. She said that she might describe Rotary in terms of service projects, fellowship and meetings but—at the heart of it all—she said that in Rotary "we change lives." This year's theme logo declares, "Rotary: Making a Difference" and it pictures people of all shapes in sizes encircled by a circle symbolizing the globe. 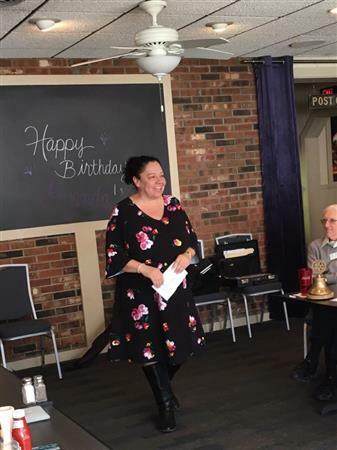 She opined that we are here in Rotary for a variety of reasons, but at the heart of it all, we are people who have a heart for service and, she said, "Those are the kinds of people I want to be around." DG Karin also spoke of the contagious Rotary Fever seen in the array of service projects at an International convention. She went on to describe exciting things being done by clubs in our district such as building ramps to homes for handicapped persons, offering job training for prison inmates and providing crock pots and food for low income families. To hear about these kinds of great service projects is to be infected with the fever. The 3 foci for this year in the district were offered by the Governor. Those are: 1) to increase service projects, 2) to raise awareness of Rotary, and 3) to bring in new members. These three foci reinforce one another; service projects raises visibility/awareness, which brings in members, who—in turn—add to the service projects that can be done. And so the wheel goes on-and-on! Finally, the DG announced the 5 District Conference that will be held from May4-6 at Mt. Washington. The concept of networking among Rotarians is being revived in District 7910 under the title, Rotary Means Business. The next Rotary Means Business event will be held at Chuck's Steakhouse in Auburn at 5:30 p.m. on Wednesday, September 27th. You can register for this event (cost is $20) by following this link to the district site: <http://rotary7910.org/event/rotary-means-business-(rmb)---guest-registration/>. Nominations for "Business of the Year"
The club is planning to resume a practice of some years ago, of honoring a local business that represents the 4-Way Test in its dealing with its customers and the community. 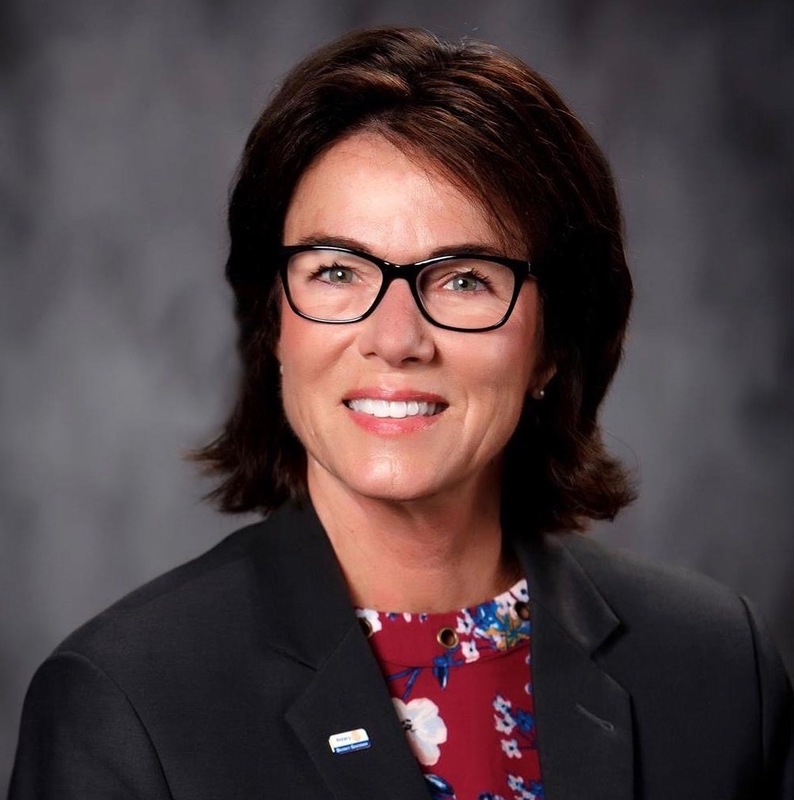 If you have nominations for the "Business of the Year," please submit them to President Kathy McSweeney with an explanation of why you feel that business represents the best ideals of Rotary. Shrewsbury Rotary at Becker "Involvement Fair"
Lori Jones represented Shrewsbury Rotary at the Becker College "Involvement Fair." The purpose of her being there was to spread information about the possible formation of a Rotaract Club at Becker under our club's auspices. Lori reports that five students expressed interest in Rotaract. Unfortunately, Ales--who will be the faculty contact for the club--has had his work permit bogged down and so will not be able to teach--and therefore provide Rotaract leadership--until the next semester. Lori will be keeping in touch with the students who have shown interest. 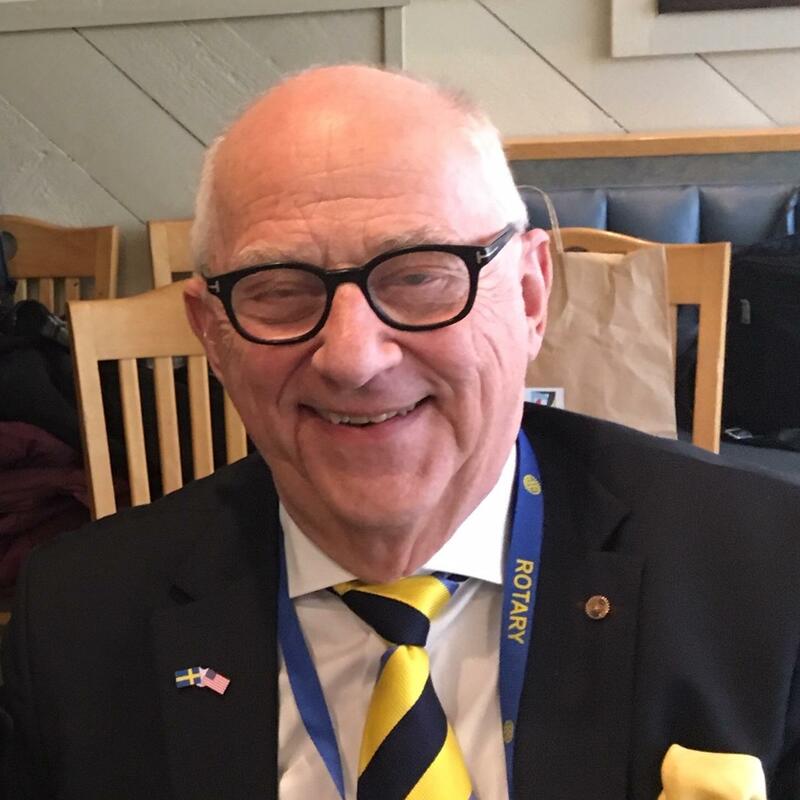 As a part of the official visit of the District Governor, the club's Board of Directors will meet with DG Karin following the club meeting at the Post Office Pub. All board members should plan to remain for about one half hour following the club meeting on September 18. District Governor, Karin Gaffney, will be making her "official" visit to the club at its regular meeting on September 18th at 12:15 PM at the Post Office Pub, North Grafton. DG Karin serves District 7910 for the 2017-2018 Rotary Year. It is a part of the governor's duties to visit each club in the district to share her/his vision for the program year with the club and for the governor to learn of the plans and goals that each club has for the year. 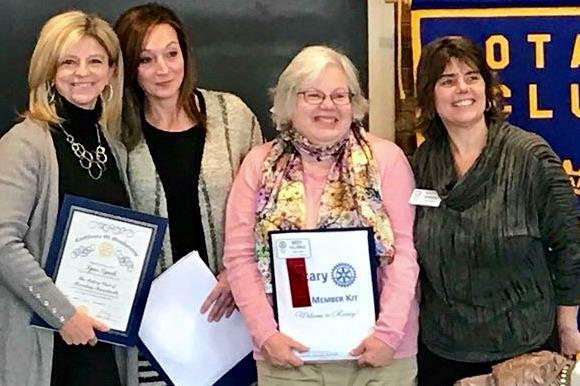 Karin Gaffney joined the Rotary Club of Nashoba Valley as a charter member in February 2012 and served as President in its charter year, successfully leading her club to receive numerous RI and District awards, including Best Club. For District 7910, Karin served for three years as an Assistant Governor and as a Trustee. She is a Paul Harris Fellow and an RLI graduate. In 2014, she was honored as Rotarian of the Year. She has chaired numerous District events, including the 2016 District Conference. There will be no meeting of the Rotary Club of Shrewsbury on Monday, September 4, Labor Day. The next regular meeting of the club will be on Monday, September 11. 1) Are we committed to our Recycle Day on April 29th, 2018? 2) Are we committed to the Shrewsbury Food and Brew Festival on June 24th, 2018? Lastly,the committee is looking to have our "Rotarian" dogs for the month of August! Yes, it's "Dog Daze" for August and we thought it would be perfect to have a collage of our pups! Please submit a "face shot" or "mutt shot" of your dog by Labor Day to craigmbarry@gmail.com! 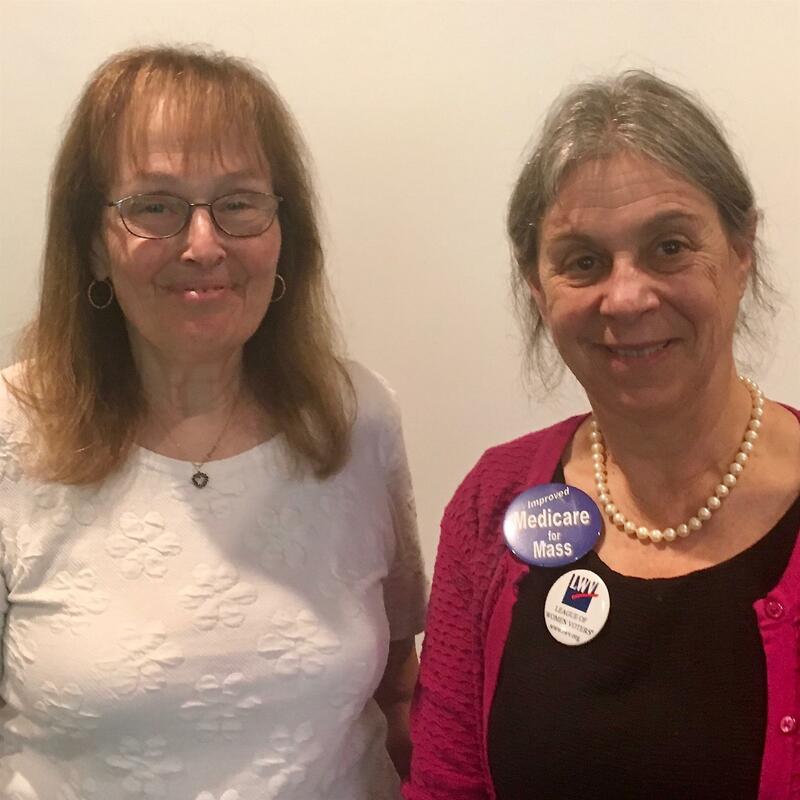 Jackie Wolf and Diana Stein of the League of Women Voters in Massachusetts, spoke to the club on August 14 on the subject of Single Payer Healthcare. The league—which is non-partisan—does back legislation in Massachusetts that is titled "Medicare for All in Massachusetts" (S619 and H2987). Acknowledging that the bill does not actually relate to the national Medicare, they explained the Leagues reason for supporting the bill. They noted that the Leagues study shows that the U.S. has the lowest life expectancy of the nations in the Organization of Economic Cooperation and Development, has the worst record of infant mortality among OECD nations and ranks 34th on the list of healthiest countries. At the same time, U.S. Citizens pay the most for healthcare per capita with costs exceeding the rate of inflation. In Massachusetts, households spend an average of 17% of their income on healthcare related costs. These rates effect state and municipal budgets and, therefore, affect everyone in the state. The women noted the waste and inefficiency of health insurance companies, citing that 30% of the insurers income goes to administration, not to healthcare. Doctors—because of the intricacies of the system—spend 20% of their costs on billing. The proposed act suggests funding for the plan with employers paying 7.5% of employees' wages and employees paying 2.5% after the first $30,000 of income. Self-employed individuals would pay 10% on income over $30,000 and 10% would be levied on unearned income over $30,000. There would be no tax on SSI, Social Security and Pension incomes. The plan would have no co-pays or deductibles. As can be easily imagined, the presentation generated spirited discussion on all sides of the issue. The next meeting of the Board of Directors of the Shrewsbury club will be held following the regular club meeting on August 14. The meeting will be held at the Post Office Pub. For the benefit of those who are fairly new to the club, the Board of Directors actually does the business of the club. The officers of the club and four at-large members serve as the board. However, any member of the club may attend a board meeting and raise issues that they feel need to come before the club. The members of the board actually have the vote on all business. At a regular club meeting—usually on the week following the meeting of the board—the issues that have come before the board, and other items of concern and interest to the members, are reported at a Club Assembly. The Shrewsbury Club ended the year with a commendable response of giving to the Rotary Foundation. This is the 100th anniversary of the Foundation, begun by RI President Arch Klumph with a donation of $26.50. At the end of the last Rotary Year, 23 club members remained of those who began the year. Of those 23, 16 members (actually 17 of all club members) contributed to the Foundation for a guvubg rate if 69.6%. Our goal was to achieve a $125 per capita gift and we achieved a $144,62 average gift to the Annual Fund and a $172.16 per capita average gift to the Foundation overall. 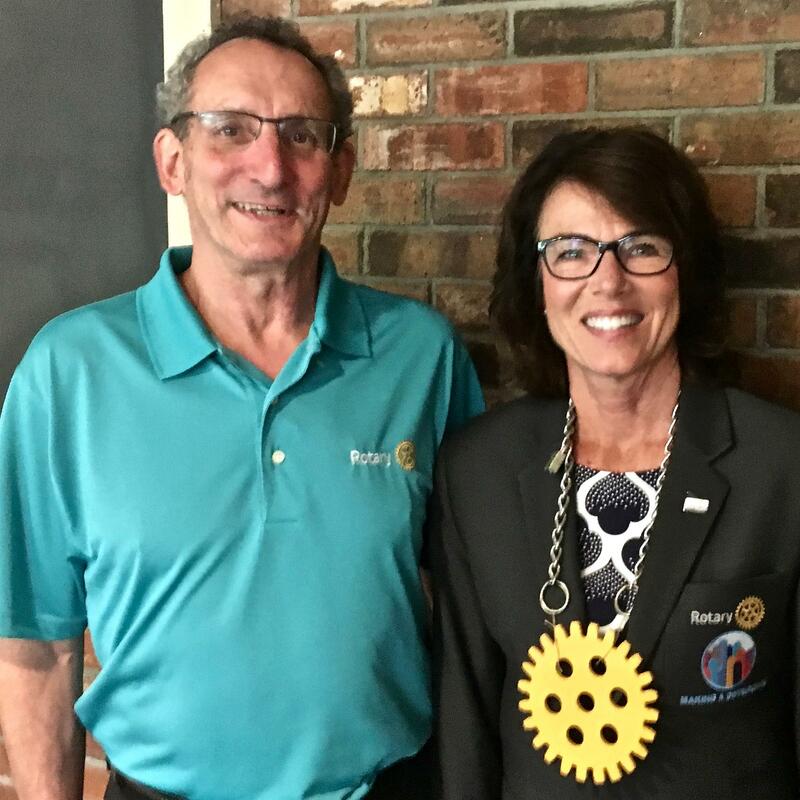 To date, the Rotary Club of Shrewsbury has donated $83,325.15 to the Rotary Foundation to conquer polio, dig wells, train local farming in underfed regions of the world, educate children and so much more. Our Goal is to have every Rotarian contribute every year. Perfect attendance is a goal for every Rotarian. Attendance at--and participation in--any Rotary event is a valid makeup for missed club meetings. Report any makeups you wish to bank by either giving the information to Art Dobson when you check into a meeting or email Cliff Gerber at <cliffgerber@icloud.com>. The speaker at the July 17th meeting was Len Sandler who spoke about his recent book, Because of You, We Live! which is the "untold story of George and Simone Stalnaker. 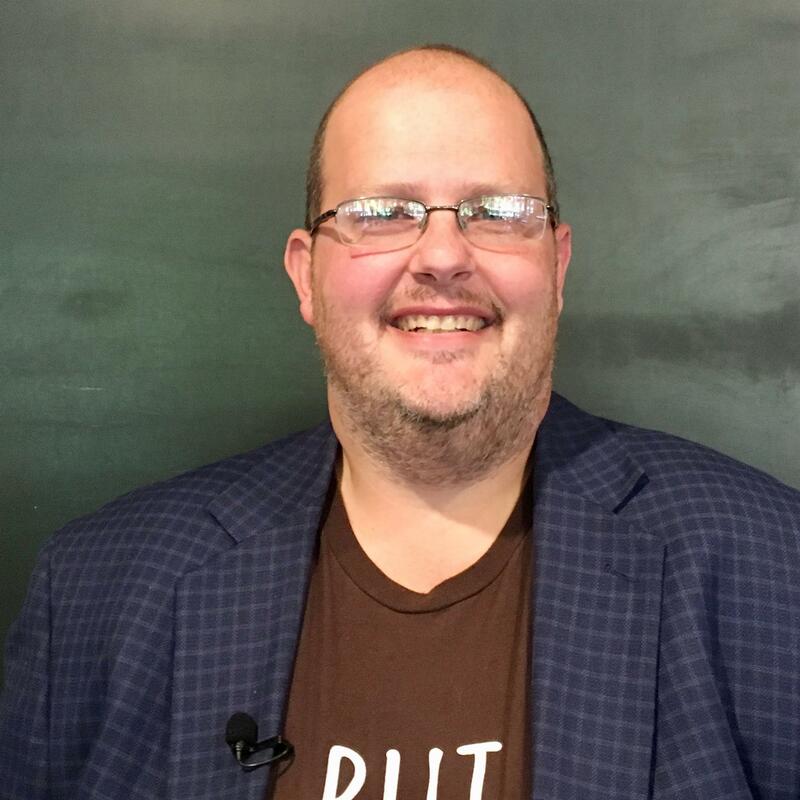 Len is a former adjunct professor at BU's School of Management and holds a Ph.D. in Organizational Behavior. He is the author of several other books. The story of the Stalnaker's is both fascinating and inspirational, a story of courage and heroism growing out of World War II. Simone was born into a privileged life on the French Riviera. At 19 she became a spy for the British and took to the streets with a rifle in hand as a part of the French Resistance and was finally imprisoned and faced a death sentence from which she was spared. George was born to a Depression era family in Iowa and graduated from West Point. 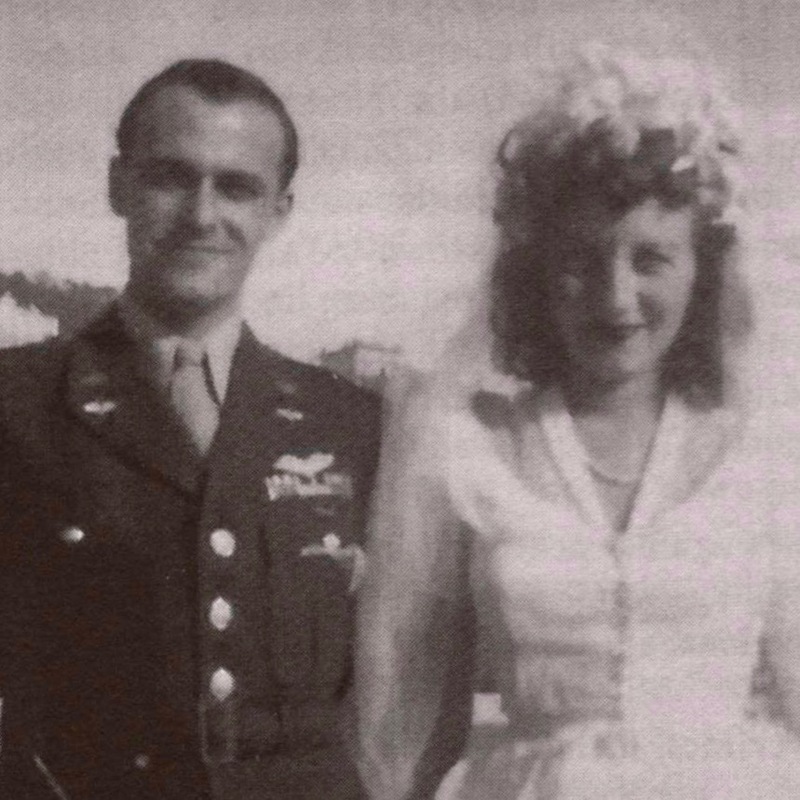 He was a pilot in the Army Air corps and rose to the rank of Lt. Colonel. He flew a mission that destroyed the last remaining reinforcement bridge for the Germans at Normandy. His B-26 was hit and he bailed out into Gestapo headquarters. George and Simone met in Parish, lived in Levittown, New York and raised a family. These two seemingly conventional people were heroes to whom we all owe a great debt of gratitude. 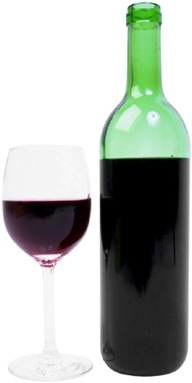 Last year's wine tasting social at Shrewsbury's own vineyard, Broken Creek Vineyard (614 South Street, Shrewsbury) was enjoyed by all club members who attended. This year we will return to Broken Creek for a social on August 28, 2017. The gathering will replace the regular lunch meeting on that date. It is scheduled to begin at 7:00 PM at the vineyard. Consider bringing guests; this would be a great opportunity to introduce someone new to Rotary! And, by all means, bring your spouse or partner.